﻿ AAA stent grafting in 2006: What have 10 years taught us? AAA stent grafting in 2006: What have 10 years taught us? Dr. Thomson is a Professor and Director, and Dr. Tam is a Research Assistant, Department of Radiology, The Alfred, Melbourne, Australia. Dr. Milne is a Vascular Surgeon, Vascular Surgery Unit, The Royal Melbourne Hospital, Victoria, Australia. Mr. McIntyre is a Regional Sales Manager for William A. Cook Australia Pty. Ltd., Brisbane, Australia. Author disclosure: Dr. Thomson is a shareholder in Angiodynamics Inc. and has received research and travel grants from Angiodynamics Inc., Cook Inc., Boston Scientific Corp., and Terumo Corp. Dr. Milne has received research and travel grants from Cook Inc. and TriVascular Inc. Dr. Tan has received a research grant from William A. Cook Australia Pty. Ltd. Mr. McIntyre is an employee of William A. Cook Australia Pty. Ltd. The exclusion of an abdominal aortic aneurysm (AAA) by placement of an intraluminal, stent-anchored, Dacron prosthetic graft retrograde from the femoral artery is vastly different from the open conventional Dacron repair, and this approach has galvanized vascular surgeons worldwide. 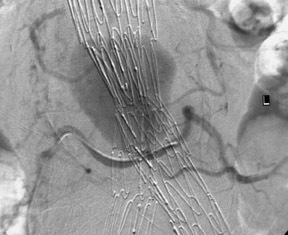 Although stent grafts were performed in Russia in the 1980s, Parodi 1 first described his technique in 1991. The first endovascular aortic graft performed in the United States was reported in May 1995. 2 Eleven years later, we have learned a great deal about the aneurysm, the endograft, and the outcome of the new procedure. The key lessons are in accurate measurement of the aneurysm, careful patient selection, selection of an appropriate device, device placement, management of endoleaks, and long-term outcome. The risk for AAA rupture is related to its maximum diameter. Rupture occurs when the wall stress exceeds the tensile strength of the aortic wall. Maximum diameters >5 cm, recent rapid growth, or pain are indications of a need for repair. Rupture of the aorta is associated with a high mortality. A longitudinal population screening study of 41,000 males in West Australia showed no definite benefit from ultrasound screening to detect abdominal aortic aneurysm. There was, however, some benefit in selected groups of men suitable for endografts between the ages of 65 and 75, provided that the rate of open operation was low. 3 In contrast, in the United Kingdom, screening once on 62-year-old men was shown to detect the 15% of men with disease, which enabled longitudinal follow-up of this group and reduced the rupture rate. 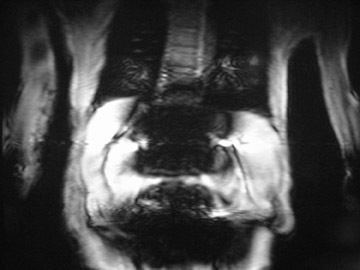 4 An AAA is often detected as a result of abdominal ultrasound or computed to-mographic (CT) examinations for other conditions. Angiography with a graduated catheter was once a prerequisite for assessment for endografting, but, as a result of improvements in CT, preoperative planning is now largely performed by multislice CT with 3-dimensional and maximum-intensity projection reconstructions. A typical CT protocol is listed in Table 1 and Figure 1. The most critical measurement is the length of the upper aneurysm neck. Ideally, the neck should be ≥15 mm in length, <30 mm in diameter, cylindrical in shape, and free of plaque without excessive tortuosity. The aim of measurement is to determine the size and length of endograft that is required. Modular bifurcated endografts have made the selection of the correct overall length much less of a problem, as they can be overlapped to create an adjustable overall length in situ. Currently, angiography has a more limited role in patients with tortuous aortas or in those in whom other procedures, such as lumbar or iliac embolization, are required. 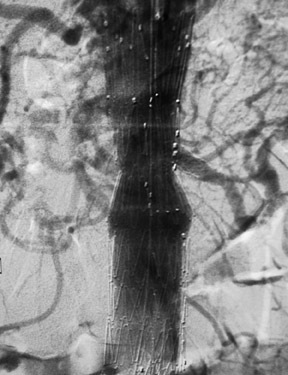 Embolization of large lumbar arteries is often considered to reduce the opportunity for type II endoleaks, and there is evidence that embolization of a patent inferior mesenteric artery prior to placement of an endograft is associated with a lower incidence of endoleak and a more rapid decrease in aneurysm size. 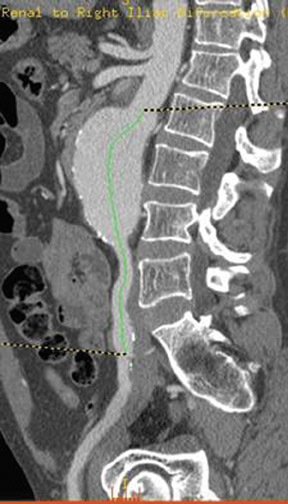 5 When the aneurysm sac has a low thrombus load, there appears to be more opportunity for connections to persist across the excluded sac between lumbar arteries and the inferior mesenteric artery. 6 When the internal iliac origin is involved in the aneurysm, the endograft is usually extended into the external iliac artery and the internal iliac artery is embolized to prevent back filling of the aneurysm. Patients selected for endograft repair should have the same indications as for a surgical repair. Although generally the patients undergoing endograft repair have smaller maximum aneurysm dimensions, there has been no benefit shown by earlier treatment. An aneurysm >5 cm in maximum dimension or one that is rapidly enlarging or tender are the usual indications for repair. Those patients who are unable to tolerate conventional open surgery have a high mortality if an endovascular repair fails during the procedure. Some causes of such failure include an inability to deploy the endograft because of tortuosity of the iliac vessels or the aneurysm itself, failure to obtain exclusion of the aneurysm with a large endoleak, and rupture of the aneurysm or the iliac arteries during deployment. Modular devices such as the Cook Zenith Flex AAA Endovascular graft (Cook Inc., Bloomington, IN) are 3-part bifurcated endografts designed for extreme tortuosity and for patients with small-caliber iliac arteries. Small iliac arteries are common in Asian populations (Figure 2). In the nature of new devices, guidelines for patient suitability for endografts have been tested. In the Australian cohort study with the Zenith endograft, 68% of the patients did not meet the manufacturer's recommended guidelines. 7 The most ignored guideline was the neck length, and breaching this guideline resulted in a 4-fold increase in endoleak; however, primary and secondary aneurysm exclusion rates were still 87% and 94%, respectively. In the abdominal aorta, a bifurcated endograft that extends from the renal arteries into the iliac arteries is almost always required. 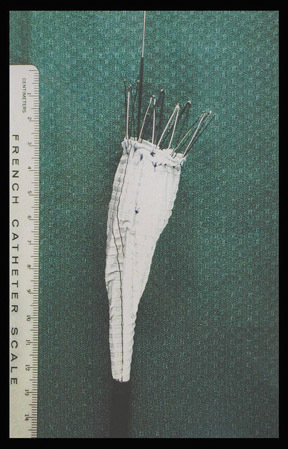 Early models of endografts were straight aortic tubes or aortouni-iliac devices and required occlusion of the contralateral common iliac artery and a femorofemoral crossover Dacron graft (Figure 3). However, bifurcated endografts are now considered standard. With most devices, the first deployment step is the release of the cranial portion of the endograft at the level of the renal arteries. The Zenith and TriVascular (Boston Scientific, Natick, MA) endografts, however, have a restraining device at the cranial end that allows a measure of adjustment after the endograft is released. Excessive movement of the partially deployed endograft may increase the possibility of emboli from the luminal thrombus and atheromatous plaque within the aneurysm (Figure 4). Adjustment of the endograft is necessary if a fenestrated endograft is selected. A fenestrated endograft is one in which there are apertures in the Dacron fabric of the endograft to allow access to major branches, such as renal or superior mesenteric arteries (Figure 5). Other design features associated with better outcomes are fully stented endografts with higher columnar support and those with a high resistance to kinking or limb extension dislocation. 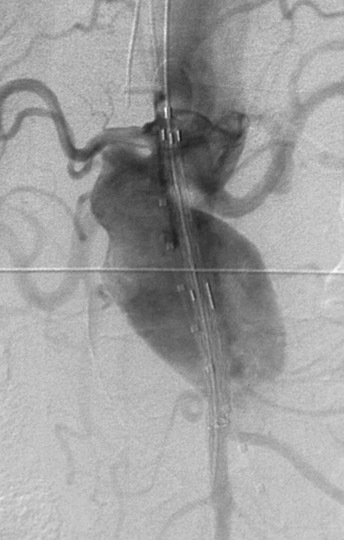 Limbs of bifurcated grafts without stent support required further intervention to prevent thrombosis or kinking in 40% of cases in the EVT phase II trial 10 with the need for placement of additional self-expanding stents in the limbs. Excessive tortuosity of the iliac arteries is associated with limb occlusion from kinking and with embolism from excessive manipulation. Selection of an endograft is a current problem in the United States, where the number of grafts approved by the Food and Drug Administration is still limited compared with the number available in Europe and Australia. In 2004, more than three fourths of the patients with an AAA ≥5.0 cm in size who were seen in a tertiary referral center were morphologically not suitable for endograft repair using 2 currently approved bifurcated endografts. 11 The main reasons for exclusion were aneurysm angulation and diameters outside the range of manufactured and commercially available endografts. The authors, however, found that >90% of patients referred to them were suitable for endografting, as they have access to custom-made endografts that overcome the usual contraindications for an "off-the-shelf" endograft. The exclusion rate in our personal series of 350 procedures is >90% (PY Milne, KR Thomson, unpublished data, July 1994 through 2004). In Australia, where there is ready access to locally manufactured Zenith grafts in both ready-made and customized configurations, it is not surprising that Cook Inc. has, by far, the largest share of the market. A recent development is the iliac bifurcated endograft that provides a branch of the iliac limb to supply the internal iliac artery. This device is a forerunner of similar branched endografts for use in the arch of the aorta and to treat thoracoabdominal aneurysms. 14,15 Preservation of the internal iliac artery removes the problem of buttock claudication. Good results of endografts for aortic transection 19 have been cited to extend the use of endografts for leaking AAA. This has the potential to significantly reduce the mortality from ruptured AAA but requires an "off-the-shelf" endograft system. Such a system is used in Melbourne, Australia at the two Level I trauma hospitals (The Alfred and The Royal Melbourne Hospitals) for thoracic aortic injury, but the range of sizes required for AAA makes this area more problematic. In spite of some manufacturer's claims to the contrary, no radiologist believes that a mobile image intensifier is as good as a fixed angiographic unit, in the abdomen or other thick body parts. However, usually for reasons of control and the remote possibility of a need for open conversion, some vascular surgeons still perform endografting of AAA in an operating room environment. In our series, no acute conversions occurred from 1995 to 2003. One acute conversion in 1994 was required for rupture during the procedure, and a second rupture occurred at the common iliac artery origin during a procedure in 2005 (PY Milne, KR Thomson, unpublished data, 2005). Both conversions were performed in the angiography suite. Apart from the imaging quality, the next most critical issues are familiarity with the device and technical skill in angiographic procedures. Care must be taken to prevent guidewires from reaching the aortic arch during abdominal endovascular procedures for AAA, as there is a risk of stroke, guidewire dissection, or perforation by the tip of the guidewires. If the device is measured incorrectly and is too short, an extension piece may be added; but if the device is too long, it may not be possible to engage the contralateral limb or the distal ends may inadvertently cover the internal iliac artery on one or both sides. When the neck is short and severely angulated, the choice of the correct device is best determined by the patient's anatomy (Figure 6). In patients in whom open surgery is impossible and in whom the aneurysm sac is large enough, it is possible to "dump" the endograft in the aneurysm sac and perform a second procedure, at a later date, with the correct-sized graft (Figure 7). Once inserted and deployed, it is almost impossible to remove an endograft by interventional means. 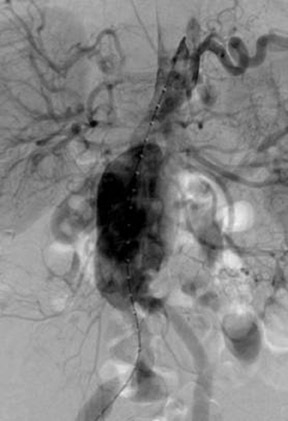 A type I endoleak at the conclusion of an endograft placement is considered a failure, as the aneurysm is still pressurized and has not been excluded. 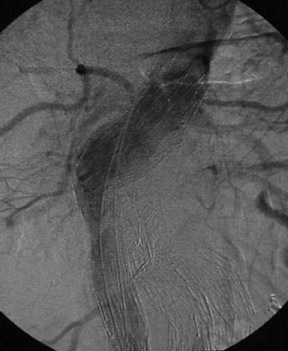 If the internal iliac artery is to be covered by one of the limbs of the endograft, internal iliac embolization is usually performed. In some centers, this is done as a separate procedure to reduce anesthetic time and iodinated contrast load. 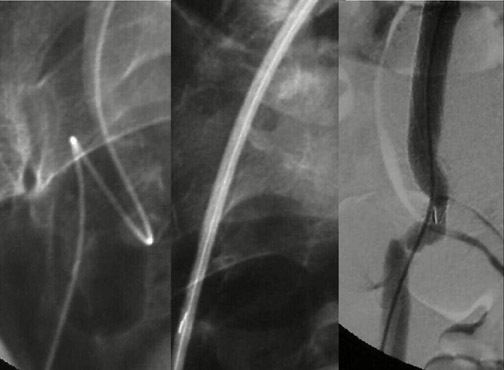 Complex endograft procedures with significant manipulation of the device and the use of multiple access catheters have a high morbidity and, sometimes, a lethal rate of trash embolism. 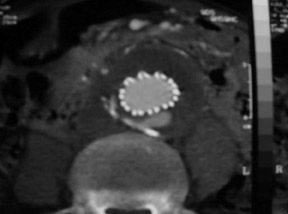 Suprarenal loose atheromatous material is dangerous and should be noted if it is present on the planning CT scan. Impotence is a rare complication of endograft repair in males but is a good reason to attempt to preserve both internal iliac arteries, if possible. An endoleak is defined as a communication from the arterial circulation with the aneurysm sac (Table 2). Endoleaks may occur at the time of deployment of the graft or may develop at a later date, up to months or years following deployment. The need for surveillance and management of endoleaks is the principal cost of endografts compared with conventional open surgical repair. However, not all sac enlargement or failure of shrinkage after treatment is due to an endoleak; in such cases, a low-pressure hygroma or seroma probably exists. 20 Imaging is used extensively to identify the presence or absence of an endoleak and to confirm the shrinkage of the aneurysm sac. Color Duplex ultrasound (CDU) and CT are the imaging modalities used for such examinations. 21 The CT protocol should allow time for a small endoleak to fill with contrast, so arterial and delayed imaging is required. 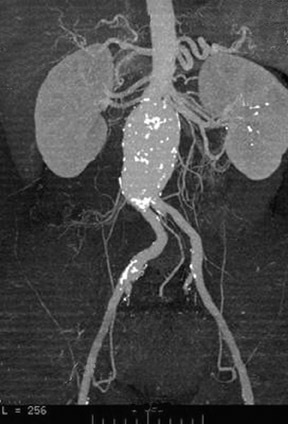 Angiography is usually indicated only when a leak has been identified by less invasive means or when there is an unexplained enlargement of the aneurysm sac. 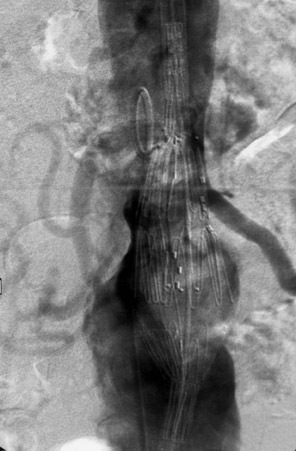 Type I endoleaks are usually large and obvious (Figure 8). Dilatation of the aneurysm neck and migration of the endograft distally or separation of the endograft limbs from the body of the endograft can produce a large type I leak that may proceed rapidly to rupture of the sac. Type II leaks, on the other hand, are more subtle and harder to find. With CDU, the flow pattern in the endoleak may indicate which endoleaks will seal spontaneously. 22 Endoleaks that are effectively a channel from one vessel to another are less likely to close than those channels that are end-connections to the aneurysm sac (Figure 9). 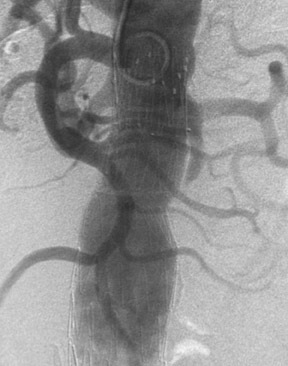 Carbon dioxide angiography is particularly sensitive for detecting a small type II endoleak. More recently, it has been found that MR angiography is 50% more sensitive than CTA for detecting a small type II endoleak. 23 Unfortunately, this technique cannot be used for stainless steel stented endografts, more because of the susceptibility artifact than because of any real risk of displacement of the endograft (Figure 10). Persistent type II endoleaks result in pressurization of the sac, and the contents remain liable to thrombolysis and variation in the size of the channel within the thrombus. 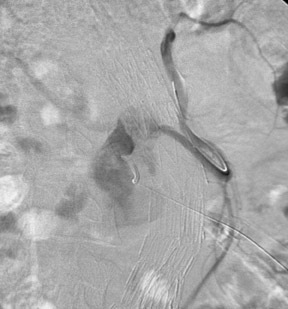 Type II endoleaks can rupture if left untreated, and failure of shrinkage or enlargement of the aneurysm sac is worthy of further investigation. Where there is no easy transluminal access through lumbar or inferior mesenteric arteries, a direct translumbar approach is performed. It is then possible to catheterize the inlet and outlet vessels selectively from the translumbar sheath (Figure 11). 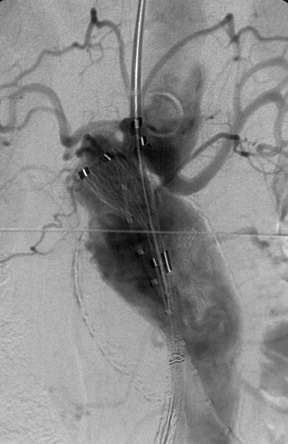 Complete occlusion of the pathway is required, as a few coils in the aneurysm sac will not promote permanent occlusion. Our experience of thrombin injection into the aneurysm sac to close an endoleak was unsatisfactory. 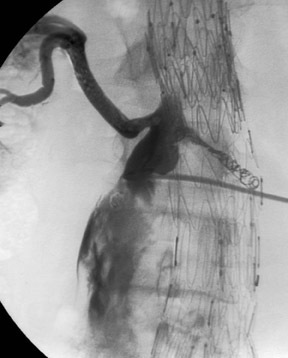 Not all endoleaks need intervention, as aneurysm shrinkage can occur even in the presence of an endoleak. Such endoleaks are usually small and type II in nature. Studies comparing open surgical repair to endograft repair of AAA have shown that both methods are effective in preventing aneurysm rupture and that the late risk of rupture following endografting is <1% per year. The 5-year survival after both methods is approximately 70%. 26 Provided patient anatomy is suitable, the aneurysm-related death rate appears to be lower following endovascular aneurysm repair (EVAR); this is because of a lower perioperative mortality rate. The major limitation of EVAR remains the need for ongoing surveillance and the increased incidence of intervention in the years following a successful treatment. Studies of the devices used show fairly similar results for similar devices. 27-30 Failed grafts are most often managed successfully by further intervention. In the next few years, we shall see further developments, including devices with biomaterials and devices that may not require the extended and expensive imaging follow-up associated with current endograft systems. However, because an endoleak can cause pressurization and enlargement of the aneurysm sac and then eventually result in an aneurysm rupture, an alternative follow-up method is still required. The cost of current follow-up protocols and the significant incidence of type II endoleaks are the most significant challenges to be overcome. Otherwise, endografts for AAA may become another discarded procedure. AAA stent grafting in 2006: What have 10 years taught us?. Appl Radiol.